It’s February 2017, how many NC farms are still selling a full range of locally grown vegetables at the markets? 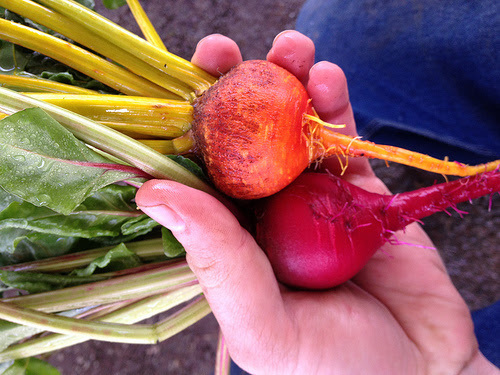 The primary goal of Tiny Farm is the production of very high quality, nutrient rich vegetables every week of the year. At Tiny Farm we view “farming” as a profession and good Farmers as professionals. A Farmer’s education is a life-long process and we strive for continuous learning. Through the years, our detailed record keeping and willingness to experiment has allowed us to develop the skills and processes to grow many type of vegetables throughout the year using passive solar techniques. 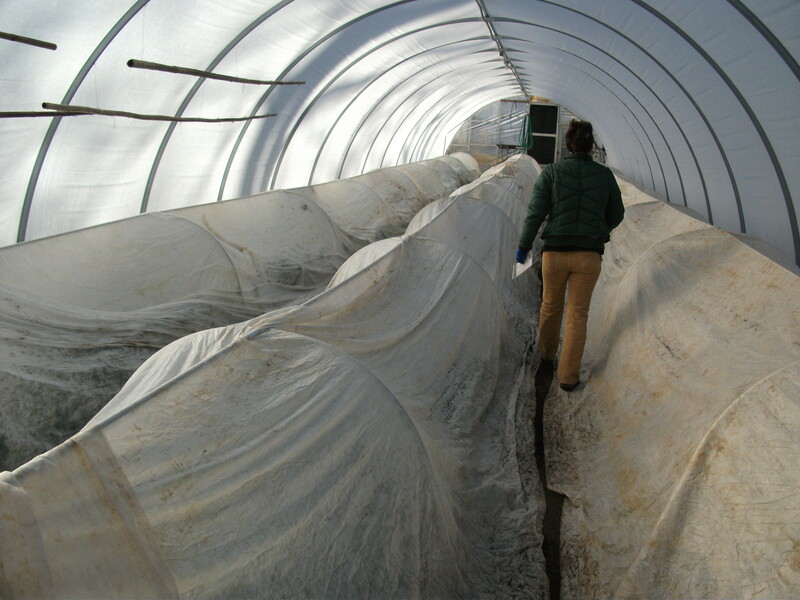 The farm is contemporary in its approach to growing vegetables: low energy inputs and novel growing techniques. Our core strategy is based on intensive crop management that produces nutrient dense vegetables year-round. We grow and sell 52 weeks a year at Farmers’ markets and direct to restaurants. 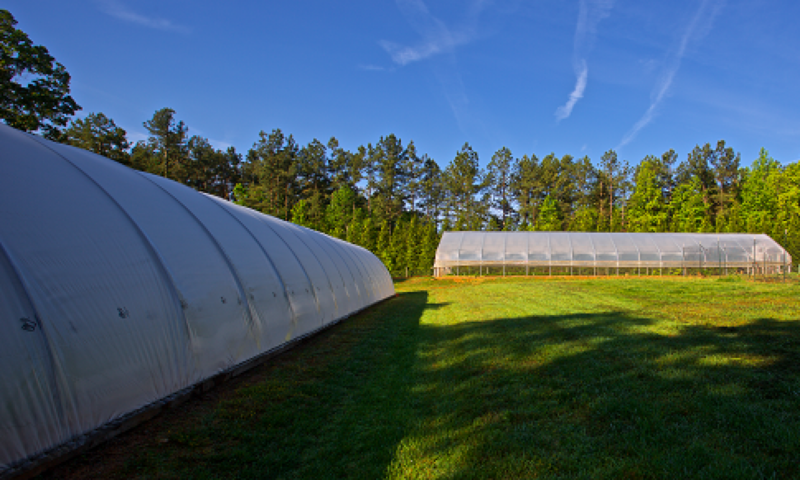 Over 90% of the vegetable production takes place in hoop houses, which you can see in the picture at the top of our page. These houses shelter both the plants and the workers. From this, work can be performed rain or shine, summer or winter. We always strive to pay sustainable wages to our of all our employees. We have chosen to avoid the use of unpaid or underpaid workers to build our farm. It is our belief that a truly sustainable farm must be able to support those who are essential to its operation. We work 7 days a week, but most members of the farm team work 5 days during the Tuesday-Saturday period. Schedules are set individually, but our core hours are Tuesday-Friday mornings. In preparation for the Farmers’ Markets, Thursdays, Fridays and Saturday are crucial harvest and preparation days. One of the founding principles of Tiny Farm was the production of high quality, tasty, colorful, clean and nutrient dense fresh vegetables for sale to our customers. We assumed that the customers of Tiny Farm’s produce would understand that growing the best would cost at bit more and that they were seeking the finest and safest produce for their families and customers. We never use synthetic compounds, sprays or fertilizers in the production of our crops. Tiny Farm only uses clean, untreated well-water to irrigate and rinse the vegetables. Our experience with pond water years ago demonstrated to us there was no way to insure that pond water was free of contaminates. Using pond water for the production of salad greens, which are served uncooked, was an unacceptable risk. We believe healthy plants resist both pests and disease (not deer, unfortunately). We use enormous amount of compost( truck loads) as a major soil medium, and we frequently mineralize with micronutrients. Tiny Farm only uses products approved for organic production in growing its produce. We use a select subset that appears to be the safest, such as soap for controlling aphids. We use insect barriers for some crops susceptible to insect problems. Lettuce is never sprayed for insects or disease. Our specialty is growing tender young lettuce very quickly. We rotate growing areas to avoid the creation of problems.. Finally, Tiny Farm welcomes you to arrange a visit, enjoy our vegetables and follow us on Twitter (@TinyFarm) and Facebook.